Caleb Laird is a student at Crossover Preparatory Academy, a branch of Crossover Community Impact. Philip and Rondalyn Abode started Crossover Community Impact, which is dedicated to restoring the community around East 36th Street North and North Peoria Avenue through a multi-faceted approach. 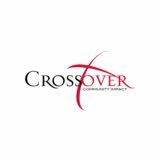 WHAT’S NEXT FOR Crossover Community Impact? CCI has plans to build a community center on the same property as its health facility. It will house the school during the day and the after-school program, youth sports and adult recreational activities outside of school hours. Rondalyn Abode, who serves as CCI’s director of development, notes they’re halfway to their capital campaign goal, with $6.95 million raised to date. The majority of the funding for CCI operations has been from private and corporate donations, but foundation support and grant opportunities are becoming a larger part of the ﬁnancial picture. CCI also holds an annual “Restoring Our Community” banquet. This year’s event is scheduled for Sept. 20. It’s a chance to bring in guest speakers and raise awareness about CCI’s work in north Tulsa. FOR MORE INFORMATION ON CCI, VISIT CROSSOVERIMPACT.ORG. Crossover Preparatory Academy Principal John Lepine Sr. works with students J’Ron Mason and Caleb Laird. The school currently instructs seventh- and eighth-grade boys, with a goal to add a new grade each year. Future plans include starting a parallel girls’ school. sports with staying on track academically, and his coaches became some of the most influential men in his life. “I learned how to properly shake someone’s hand from one of my coaches. I learned about how to make it in life from a different coach,” Philip says. “Sports also taught me the value of hard work, pushing yourself and finishing things. The combination of being a good athlete and having good grades gave me a lot of opportunities that I wouldn’t have had otherwise.” The relationships that Philip developed were huge. “He would always say he had conversations as ‘Coach Philip’ that he never would have had as ‘Pastor Philip’,” Rondalyn says, adding that he saw a lot of third-grade kids that were already statistics, such as academic failure, attitude issues and a lack of a father in their life. “That was a big part of why he wanted to start the school.” Youth sports became a cornerstone of everything that followed, as coaching led quickly to after-school mentoring and tutoring. Philip had dreams of starting a nonprofit to address the issues he saw in the community, but he was busy keeping his fledgling church up and running. In 2010, a mutual friend introduced Philip to Justin Pickard, who had been living with his family in north Tulsa. Justin and Philip soon discovered they shared a similar vision for restoring their community. “Our lists were almost identical,” Philip recalls. 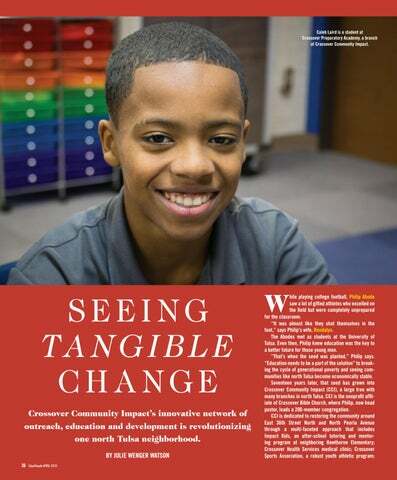 “That’s when we knew we needed to partner up.” In 2011, Crossover Community Impact was born, and Justin began a two-year graduate program in urban development at Harvard University, assuming the role of CCI’s executive director, along with his studies. “We were on the phone every week, working on stuff while I was there,” Justin says. It was a rough start. Not only was the executive director of their new nonprofit living 1,500 miles away, but that following summer, Philip, who had been diagnosed with cancer, went through seven weeks of radiation and chemotherapy. CCI had already begun a sports program, which he oversaw. “It was crazy,” Rondalyn says. “Philip lost 22 pounds in four weeks. He wasn’t supposed to be in the sun, because they had irradiated the inside of his throat, so he’s out there coaching youth football, holding an umbrella.” Philip nods in agreement. “We almost didn’t start, but we’d already gotten to the point where we needed to. I had a good prognosis, but after seven weeks of radiation, I was miserable. We got the team going, though,” he adds. “And we won the championship that year.” Faith was, and continues to be, central to the Abodes’ life and vision. “God does the heavy lifting because we don’t get to where we are just based on our ingenuity and know-how,” Philip says. “It’s connections and things coming about that are impossible to plan.” Like the medical clinic, for example. Although for families with Medicare and Medicaid there are good options for free health care in north Tulsa, finding a general practitioner for those not on Medicare or Medicaid in north Tulsa often meant traveling across town, Rondalyn notes. When a retiring physician with an existing medical facility on property adjacent to Hawthorne Park, 940 E. 33rd St. N., offered to sell his land to CCI, Justin and the Abodes saw the opportunity to create a clinic near their existing after-school sports and tutoring programs in the heart of the neighborhood they were seeking to transform. With generous donations from CCI supporters and a fortuitous land swap with George Kaiser Family Foundation, CCI was able to close the deal. Dr. Kent Farish, a physician on the CCI board not only loaned CCI the additional money needed to get the clinic up and running, he closed his own south Tulsa practice of 30 years and moved to north Tulsa, where he still works about 10 hours a week at the facility. According to Rondalyn, the clinic, which also has two full-time providers, serves 4,400 patients per year while offering general, pediatric and prenatal care. Takia Jones, now a college intern, has been involved with Impact Kids for several years, previously as a Street Leader. Here she works with Shawn Hatcher at a recent Impact Kids session.